With holiday dessert buffets coming up soon, National Cake Decorating Day is the perfect time to practice your technique! Halloween’s just a few short weeks away! Learning to create spooky ghosts, spiderwebs, pumpkins, and broomsticks from icing and fondant could be the perfect warm-up for embellishing cakes, cupcakes, and cookies with intricate snowy Christmas scenes a little later on. And think of all the fun you can have mixing frosting colors — like dyeing Easter eggs, but with lickable spoons. ​​The International Cake Exploration Societé (ICES) was founded in Monroe, Michigan, at the National EXPO Cake Show, based on cake decorators sharing and caring for their craft. At their Annual Convention and Show, held in a different U.S. location each year, members enjoy demonstrations and classes, and displays of amazing cakes and sugar art. ​Although sugar sculpting for festive occasions had become a specialty of Italian chefs as early as the 1600s, it wasn’t until nearly a century later that these decorations began to be applied to cakes. "The Experienced English Housekeeper," written by a Mrs. Raffald and published in 1769, includes three successive recipes for a rich cake, marzipan, and icing. ​When Charles II returned from exile in France with a deep love for pastry, he was accompanied by some of his favorite French pastry chefs. These men, who were less than inspired by rather dull-looking English almond buns, suggested they should be iced with a crust of sugar, then embellished with trinkets. Please don’t let the word “palette” scare you. It just means a harmonious combination of colors, and starts with just two tones. Think team colors and holiday hues: purple and gold, orange and black, red and green. One of these pairs could be your main colors. Then add contrast and accent colors to fill out the palette. For example, if you’re working with orange and black for a Halloween party, you could add small amounts of bright gold (maybe sparkly metallic gold! ), white, dark brown, and maybe even a ghoulish touch of bright blood-red. And guess what? You could apply this color palette to your entire party. Get some marzipan (almond paste, available at most craft or cake decorating shops), mix in the colors you want, roll it into thin sheets, use those fancy cookie cutters to create pumpkins and other simple shapes, and apply them to your frosted cupcakes or cookies. Spoon a small amount of black or blood-red icing into a bottom corner of a sandwich-size plastic baggy, then snip off a tiny (we mean really tiny) corner, and ​squeeze to write a spooky Halloween message on your cake. ​Novelty candies like gummy spiders make the easiest decorations of all: just press them into your cookies or cake, and just like that, your treats are all tricked out! Grab some cookie cutters shaped like a heart, turkey, Christmas tree, or snowflake — then add ​festive icing colors, sparkly candies, and sprinkles! That way, you can use all our Halloween cake decorating tricks for any holiday, from Valentine's Day to New Year's Eve! After you've mixed your icing colors, the real cake decorating fun begins! Do you love watercolors? You can dilute your icing with a little water, then brush the delicate washes of color onto your frosted cake to evoke an Impressionist garden scene. 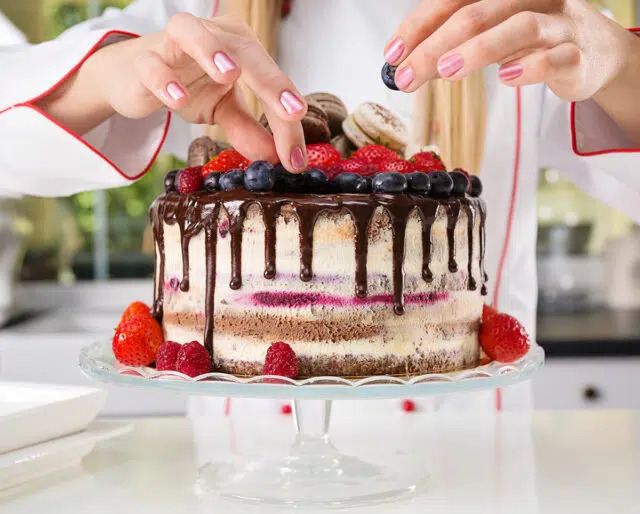 If you're more into modern style, try a trendy drip cake: After frosting your entire care, drizzle a contrasting color over the top, letting it drip down the sides. Jackson Pollock would be so proud. You don’t need a holiday as an excuse to decorate a cake. (And for that matter, decorating isn’t limited to full-size cakes. Mini cakes, cupcakes, and cookies are all perfect little blank canvases to fill with your artistic vision, even if you’re just making an after-school treat for the kids.) Cake decorating can be as simple as using one frosting color on the outside, with a different color between layers, or as elaborate as the massive fantasy creations seen on magazine covers. Any special touch counts. Yes, that includes rainbow sprinkles.